Over the years we have received letters from people telling us how to pronounce the name of this breed. The letters contradict one another. Everyone seems to have their own opinion on the proper way the name of this breed should be pronounced. Below are variations and some comments we have received. "The pronunciation you provide for the breed of Newfoundland dogs is incorrect. It is "New-fun-land" dogs. It is a source of some hilarity to native "Newfunlanders" to hear such variations as the one you suggest." "On your page about Newfoundland dogs you have included an incorrect pronunciation of Newfoundland. The portion of the word spelt ‘found’ is pronounced as it is written, not as FUN." "Regarding your information concerning the Newfoundland; the proper pronunciation of the name is "Newf-in-land". When said correctly it will rhyme with UNDERSTAND. Many, many times we hear the name of our province, and the beautiful dog mispronounced. It becomes quite irritating, especially when it’s mangled by people who profess to know something about our wonderful dog and/or people. Please, it's not "Newfinnlund" or Newfundlind or Newfoundlind." "As a native of "Newfoundland and Labrador" please know that I am 100% positive that your pronunciation of the Newfoundland breed and our province's name is wrong. 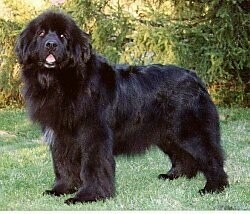 Please do NOT suggest people pronounce Newfoundland land as Newf-in-land. It is spoken as it is spelled. If it helps: New-found-land." This gentle giant is quite content to laze around the house, but still needs to be taken on a daily walk. While out on the walk the dog must be made to heel beside or behind the person holding the lead, as in a dog's mind the leader leads the way, and that leader needs to be the human. It will enjoy frequent opportunities to swim and frolic. Daily to weekly brushing of the thick, coarse, double coat with a hard brush is important. 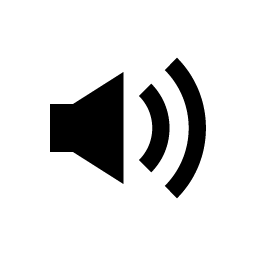 The undercoat is shed twice a year in the spring and fall and extra care is required at these times. (The heaviest shedding period comes in the spring). Avoid bathing unless absolutely necessary, as this strips away the coat's natural oils. Instead, dry shampoo from time to time. 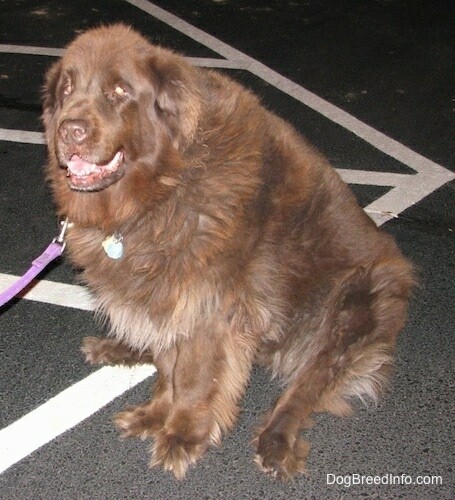 The Newfoundland may be a descendant of the Viking "bear dogs" or nomadic Indian dogs. 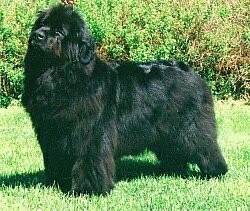 Others believe the Newfoundland is a close relative of the Labrador. This theory is based on the similarities between the two breeds and the fact that the coast of Newfoundland and Labrador are very close to each other. It is possible that the Labrador, which is an excellent swimmer, was able to swim the Strait of Belle Isle or cross on foot when the water was frozen. 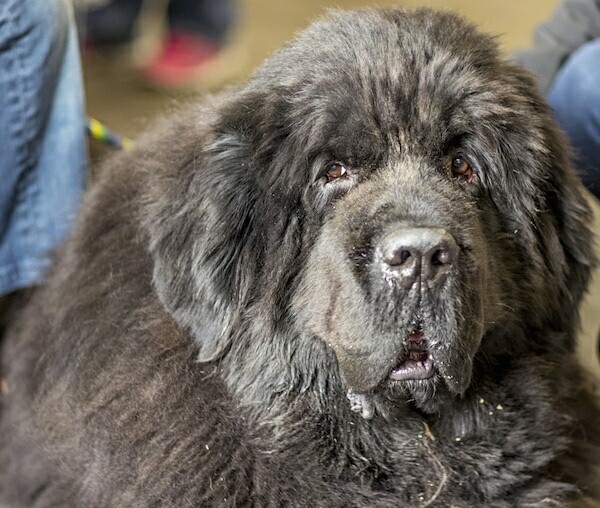 Many believe the Newfoundland originated from crosses between Tibetan Mastiffs brought to Canada by British or European fisherman and local dogs early in the 1700s. In any case, the resulting breed found a niche aiding fisherman off the coast of Newfoundland, Canada. 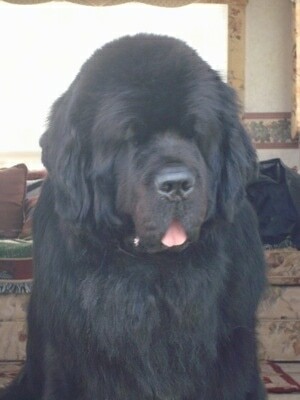 Others say the Newfoundland dog is related to the Labrador, however not in the way stated above.... The breed was already in St John's in Newfoundland 500-odd years ago when Cabot arrived, this much is known from written accounts of visitors just a few years after his landing. The Vikings, who were here 500 years before that or another group may have brought the animal to these shores. The Labrador dog is descended from a dog called the St. John's Water Dog and selective pairing with the Newfoundland. 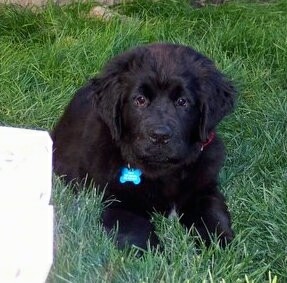 In the early days of this breed, before they were called Labs they were known as "the lesser Newfoundland dog." The name Labrador was given to them after they started to become popular for their fine attributes. This gentle giant was used for hauling in nets, carrying boat lines to shore, retrieving anything which fell overboard and rescuing shipwrecked and drowning victims. The breed was also used to haul lumber, pull mail sheds, deliver milk and carry loads in packs. 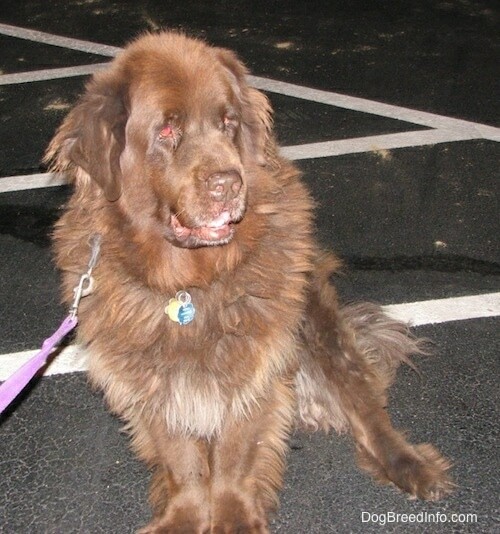 The Newfoundland was, and still is, an outstanding instinctive water rescue dog. Many owe their lives to members of the breed. In 1919 a gold medal was awarded to a Newfoundland that pulled to safety a lifeboat containing twenty shipwrecked people. It has been called the St. Bernard of the water. 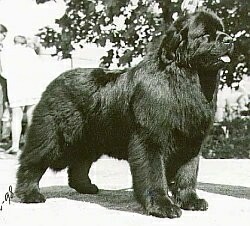 During World War II, Newfoundlands hauled supplies and ammunition for the armed forces in blizzard conditions in Alaska and the Aleutian Islands. Today, safer ships and improved communications have limited the dog's processional activities but its appeal has not diminished due to the fact that it is considered a handsome, devoted, delightful companion. It is still very good at water trials, competitive obedience, weight pulling, carting, backpacking, and as a watchdog and guarding dog. The Newfoundland Club of America holds drafting and water rescue tests. 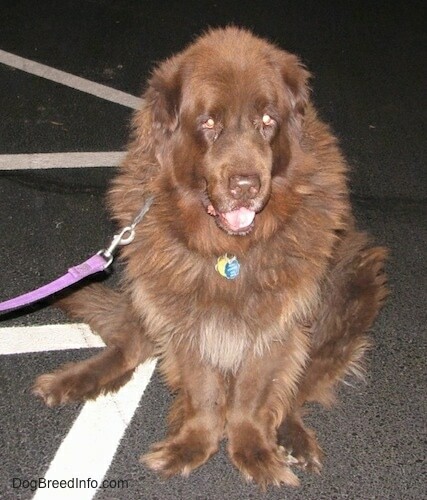 "Karazan Paris the Newfie has won virtually everything there is to win and is an absolute sweetheart. This is a picture of him at the Regional Newfoundland Specialty Show in Dixon, California, when he was 10 years old. Even at 10 years old, he looks and acts like a puppy. All our dogs are a real tribute to the incredible breeding of Phyllis Colgan of the Karazan Kennels in Napa." 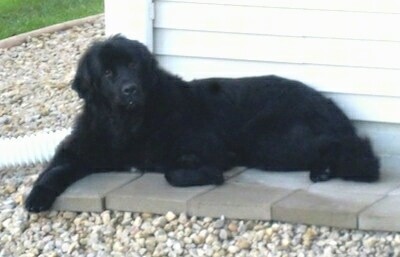 Storm the Newfoundland as a puppy at about 4 months old—"Storm loves kids. He is incredibly playful, but also very lazy. He loves the snow in the winter. He is an amazing family dog." This is Aarnikarhun Galateia aka Demi from Kennel Destellon. This is Aarnikarhun Escuela aka Elsa from Kennel Destellon. This is Jydekompagniet`s Apple-Jack aka Jaki from Kennal Destellon. 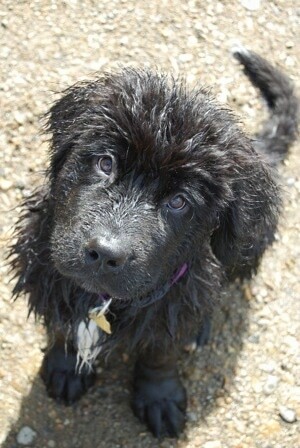 "This is our Newfoundland puppy Stella at 3 months old. She is a very happy puppy, and loves the water."